Tooth and Nail’s Happy Christmas compilations have been hit or miss. Volume 2 was the best of the bunch, while the rest good songs, just not great as a whole. So 5 years since Volume 4 was released, the Nail has given us a 5th Volume of new and old christmas songs. Hawk Nelson kicks off the album with their take on The Chipmunk Song, making it a nice compact pop punk song. Demon Hunter’s “The Wind” doesn’t have your standard christmas feel but it is a fantastic ballad for DH. Fans who were looking for more ballads on The World is a Thorn should give this track a listen. Ivoryline and Copeland run into the same problem. Ivoryline’s version of O’ Holy Night is nice but Seven Day Jesus’ version from the first Happy Christmas compilation is still the hands down best version of that song. Copeland, who ends the album with Have Yourself A Merry Little Christmas , while putting their own weird spin on the song, they don’t match the simplicity or beauty that Starflyer 59 had when they did the song. Thousand Foot Krutch takes on Heat Miser from A Year Without Santa Claus. Their alter ego FM Static does Snow Miser. Heat Miser is although a standard rapcore track it’s so upbeat and fun that I found myself bobbing my head and enjoying the track. Snow Miser is a low key piano track that’s done so nice. August Burns Red delivers another metal instrumental track, O Come O Come Emmanuel, that makes me continue to want a full length christmas album from ABR. Emery’s track musically is nice but a little forgetable, but lyrically it’s one of the best songs Emery’s ever written. Family Force Five is the biggest surprise on the album. Their track, It’s Christmas Day, I liked so much that I hit replay instantly when the song was done and was shocked to see it was Family Force Five. Just a beautifully great song. Bon Voyage gives us a nice little indie pop song and Sent by Ravens does a nice job with Happy Christmas (War is Over), although their version doesn’t make me like the song. The quirky songs have always been the best part of the Happy Christmas Compilations and volume 5 doesn’t disappoint. Queens Clubs puts an amazing dance spin on You’re A Mean One Mr Grinch. It’s so good. Then Neon Horse, an already eccentric band, delivers on Zat You Santa Claus. Happy Christmas Volume 5 is a solid outputting of quality Christmas music. The mix of classic Christmas songs that everyone knows and brand new tracks written for this album are nice. 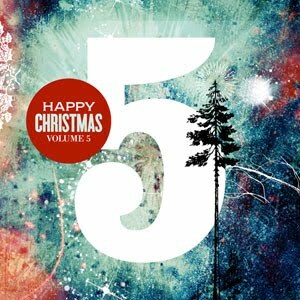 If you’re looking for some new Christmas music, Happy Christmas Volume 5 is a good album to get.